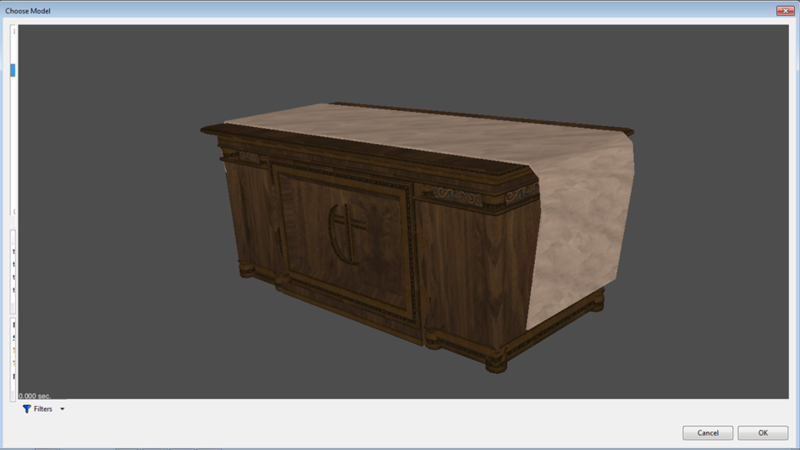 Dragofer's Stuff - an all-in-one package of many of the assets found in this thread. Skins and materials have been merged so there's no overlap. To install, place or extract the archive into the darkmod/fm folder of your mission. 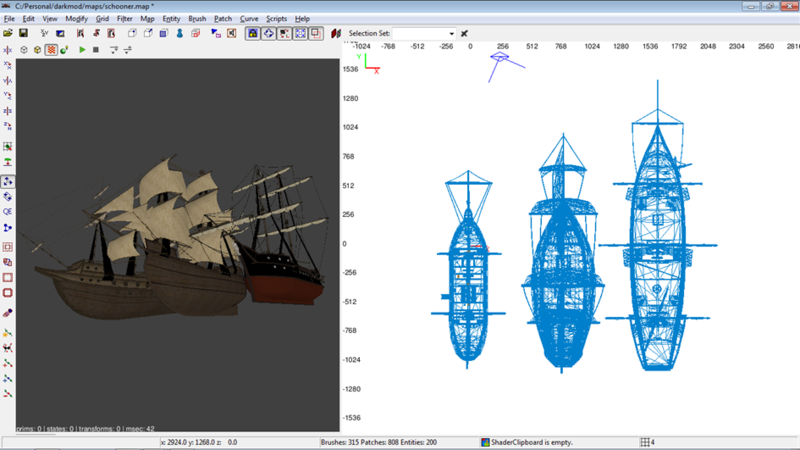 Weathered Ships - two small ships, fully mapped with interiors, available moored or sailing and with LOD scale models. 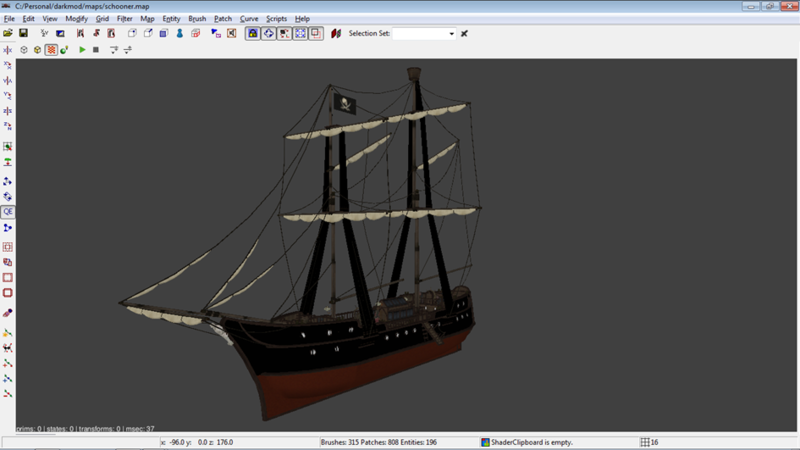 Caravel - a merchant ship made in Blender, including a scale model. The lifesize variant is somewhat overscaled in order to comply with minimum ceiling height requirements on both decks. Can be scaled down if you don't plan to give it an interior. 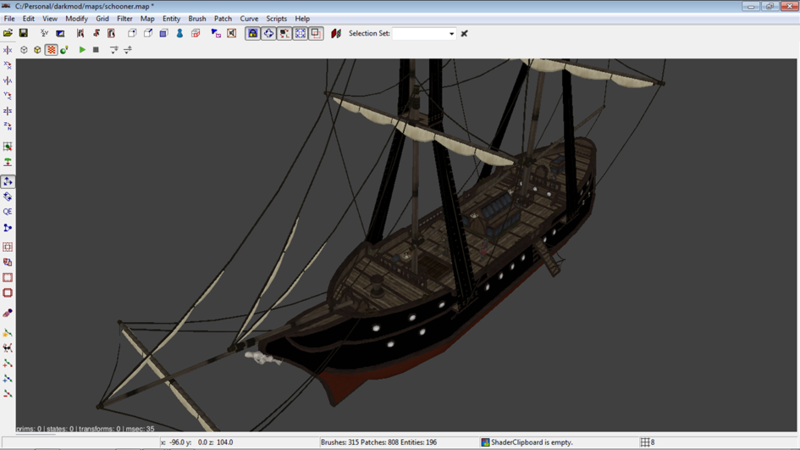 Additional ships in the form of scale models can be found in Down by the Riverside, but they haven't been optimised. 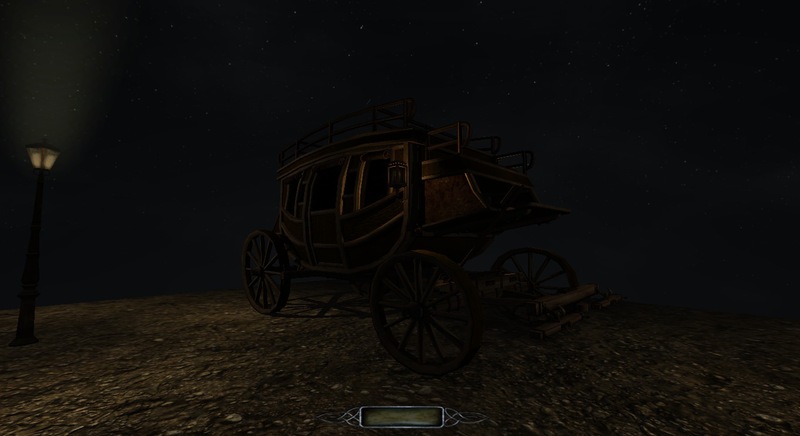 A moving stagecoach setup can be found in both maps of Down by the Riverside. Note that this mission uses an older variant of the stagecoach. Thanks for your suggestion, here's a new longer version with steam propulsion. To begin with, I made a new ship, which is an idea I got after walking around my old carack and seeing many ways to do things better. 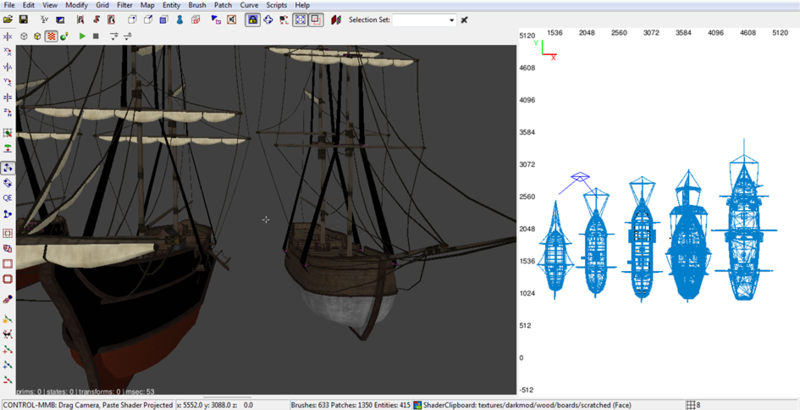 This one is a smaller, single-decked ship with two masts, made entirely in DarkRadiant. 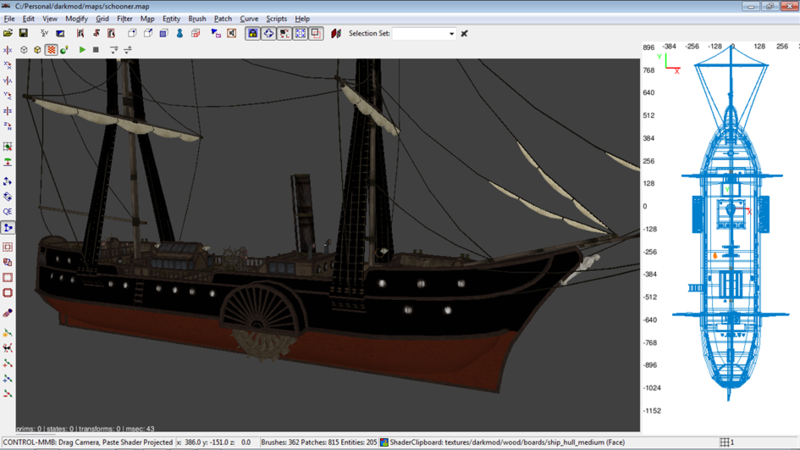 The idea was to have a much tidier construction from the beginning, which suited a Victorian age ship (and rectangular railings can look surprisingly good ) The end result is 17500 polys, compared to 27000 polys for my carack and 16000 for Pink_Dot's galleon. I'd be happy for others to use it before I do (a while still), though it still needs to be optimised a lot. Some quick scenery. Comes with both gangplanks and ladders (still needs mooring ropes). Only editor screenshots at the moment because it's not so easy for me to recolour the wood textures - ingame, only a small area around me has the new colour. 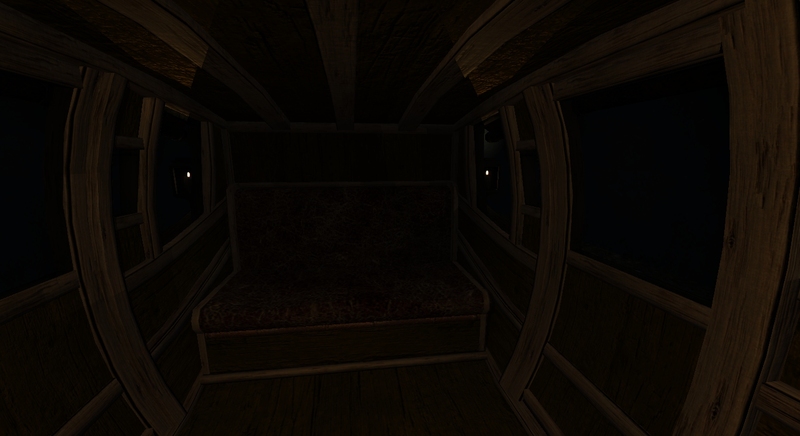 So I'm using the black_matt texture for now, which is invisible ingame at night. Also, an altar, as .ase. Somehow 1450 polys, but now that I looked at it again I saw plenty places to shave off some polys. Edited by Dragofer, 30 May 2018 - 01:41 PM. Very nice looking ship. Just dont make it too tight because I remember some problems in 1st officer room in your carrack. As a suggestion ship could have steam powered winches for sails and anchor like 19th century schooners. Since you cant really put many sailors on ship this would be perfect excuse for smaller crew. Looks really good, the only crit I would have is the lack of hammers on the altar (assuming this is for TDM of course). Edited by Moonbo, 08 April 2015 - 07:47 PM. I'd be happy for others to use it before I do (a while still), though it still needs to be optimised a lot. 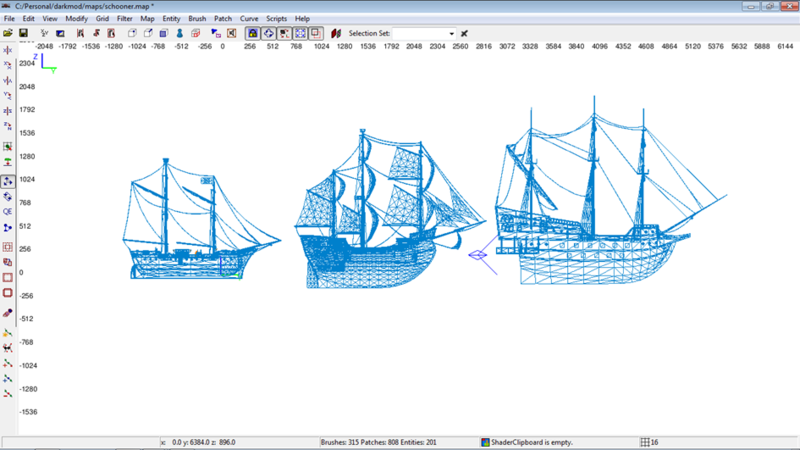 It's several months away, but there could definitely be a use for those ships in an upcoming project. Man That is awesome. Absolutely well made so far and very impressive. There is a pop about 141.00 in the exterior sound effect stream I think sort of broke the otherwise engrossing sound environment. I could just imagine creeping on and looking over my shoulder as the crack of a rope struck a mast. The problems of using a tight space are very familiar to me, I lost count of the number of times I wanted to extend the carack After my last experience this one will be more user-friendly. The rooms will use the whole width this time, and with the different hull this new ship has almost the same interior length and width as my old one despite being much smaller. At this point I'll also say that it takes almost the same time to build a smaller ship (exterior) as a larger ship. 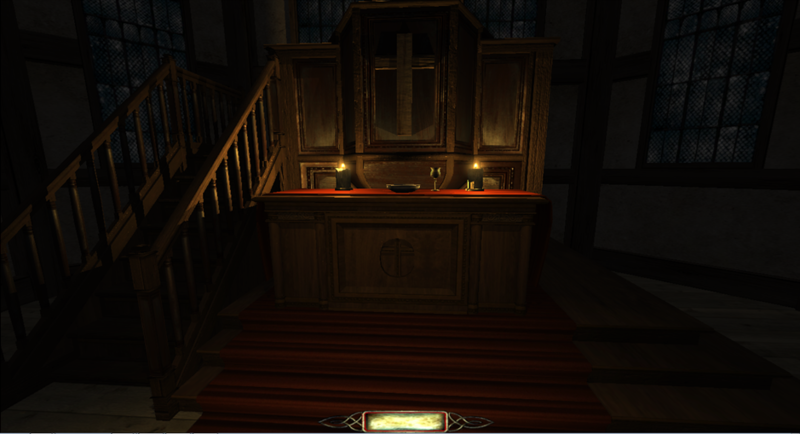 That was meant as a church of God, but with a few tweaks and extra patches the cross can turn into a Builder hammer. Thanks for your opinion - yeah, you can hear a car and someone speaking at some points in the recordings, so my plan is to take a clean 20 second piece and loop it. Edited by Dragofer, 09 April 2015 - 05:20 PM. 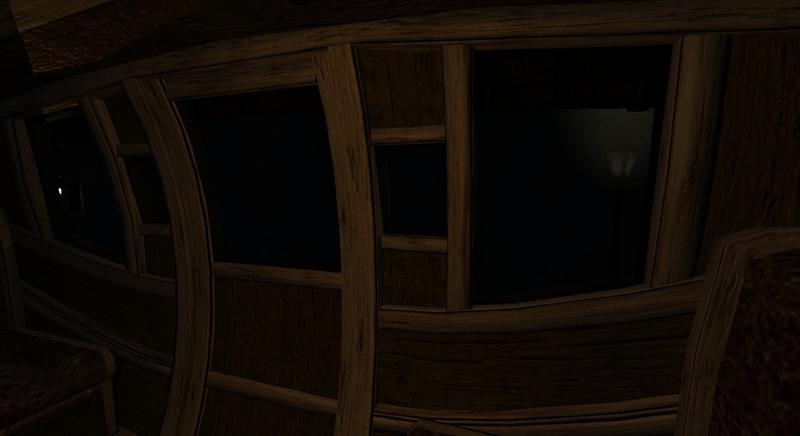 The darkwood used on the hull wont show up to well in-game as its too dark. Maybe change it for "textures/darkmod/wood/boards/ship_hull_dark"
The fence on the board plank woudnt be of much use for grabbing onto at the top near the ship. Fyi the handrail should be no more thna 48 units above the plank. Very nice alter, but instead of a scross we should have a builder symbol/model. I get what your saying about creeks from the moorings rubbing against the hull. Thats very much part of the internal sound file I think. Environment effects anyone would be happy with but I didn't hear any poeople. Edited by Tr00pertj, 09 April 2015 - 08:54 AM. Edited by Dragofer, 14 April 2015 - 04:15 AM. Sorry mate, did you say you made those "inside" DR?! Because that would be mental, you deserve some kind of award or something, those models look very refined, plausible you know. And theres a whole fleet of them! Im not sure people are actually aware of the kind of work going on here. Amazing stuff, hopefully you'll put it to good use in your own mission? Edited by RPGista, 17 April 2015 - 02:02 PM. Thanks! I'm glad to hear you like these. Using DR is a bit of a habit - by now I'm familiar with the editor, unlike Blender. There are a lot of vertices to drag around, but it works eventually and it's much less technically involved, skipping things like unwrapping and exporting, and you can use the same controls you've practised in map-building already. Maybe this explains the latest trend in using DR this way. Sometimes I wonder if there are differences between a patch (.ase) "model" and one in Blender, like performance, but then again in a patch ship it's much easier to turn off/on shadows and clipmodels or for someone else to make changes. hopefully you'll put it to good use in your own mission? Maybe this explains the latest trend in using DR this way. 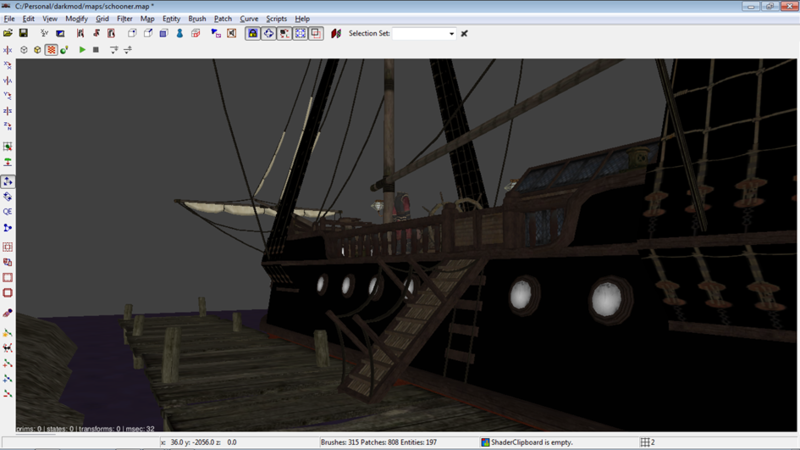 I make all my models in DR, I just wish the .ASE export didnt screw about with the textures. # Inc., 59 Temple Place - Suite 330, Boston, MA  02111-1307, USA. script = "Dark Radiant ASCII Scene Export (*.ase)"
author = "Richard Bartlett, some additions by greebo and tels"
Youv'e linked me to the ase_blend_export thread?. The blend export script works like the normal export script if you don't use the blend texture. I don't have a fixed version of the original script lying around, although I think I've uploaded it once here. But I would have to search it. It's easier if you just use that one. A horsedrawn stage coach, and some new lamps. They would use these coaches in the past for covering long distances overland with packages, passengers and maybe also funds for a business transaction onboard. 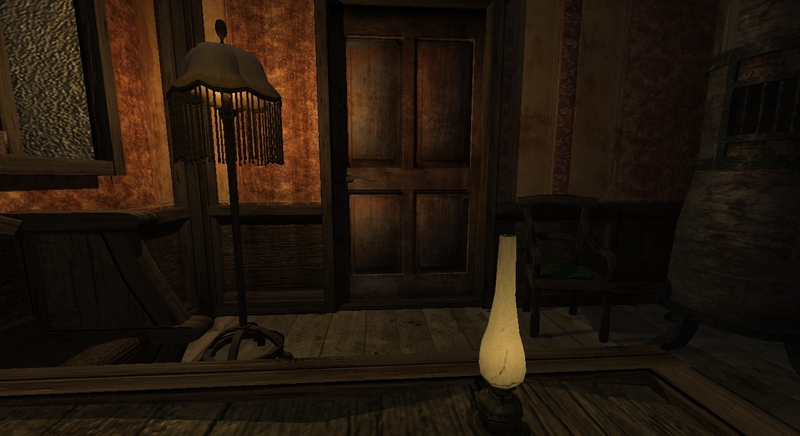 There are real candles in the lanterns, and you can look out through the windows (or guards can look in). Also 2 new lights: the tall lamp is electric with a bulb, with those dangling ropes it's 3100 polys, 1300 without. It's strange because the ropes and their ends are fixed at 1 subdivision. Luckily lamps aren't set to cast shadows. The small one is an old oil lamp at 540 polys. Edited by Dragofer, 29 June 2017 - 10:19 AM. @Dragofer, can you PM a link to all the models you have made and I will go through them and add all the apropriate ones to the SVN so they are part of the eventual 2.04 update. I don't think the stage coaches are especially modern. "By the mid 17th century, a basic stagecoach infrastructure had been put in place. The first stagecoach route started in 1610 and ran from Edinburgh to Leith"
It's pretty damn impressive, but what format is it? It's harder to include assets that aren't models or entities. Agreed, and they would make an excellent addition to the mod. I've followed your suggestion and stripped out the interior. That reduced the total polys by 1000 and now 2100 polys cast shadows. 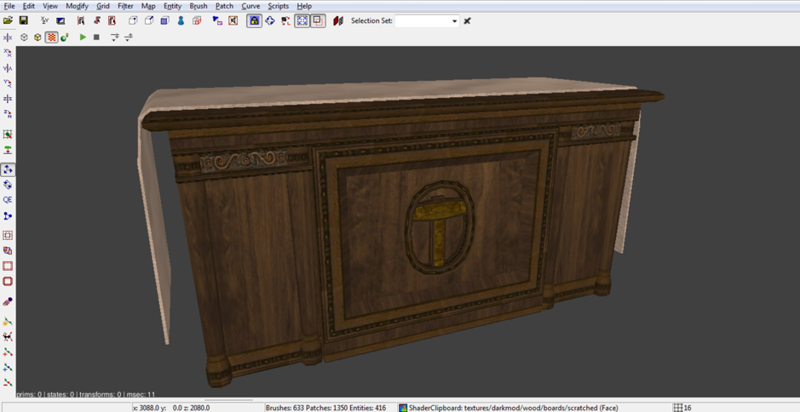 And it led to a fun discovery: the dark wood is actually a colorme texture! I've made another version of this coach that uses the colorme texture for the trim too, so you can select the trim or body panels and give them new colours with the _color spawnarg. A small downside is that the trim looks less sharp because the original texture gives a shadow at the edges. Sure, a lot of these things just need to be fixed up so they work properly. "By the mid 17th century, a basic stagecoach infrastructure had been put in place.%5B6%5D The first stagecoach route started in 1610 and ran from Edinburgh to Leith"
They're all a collection of patches made in DR. 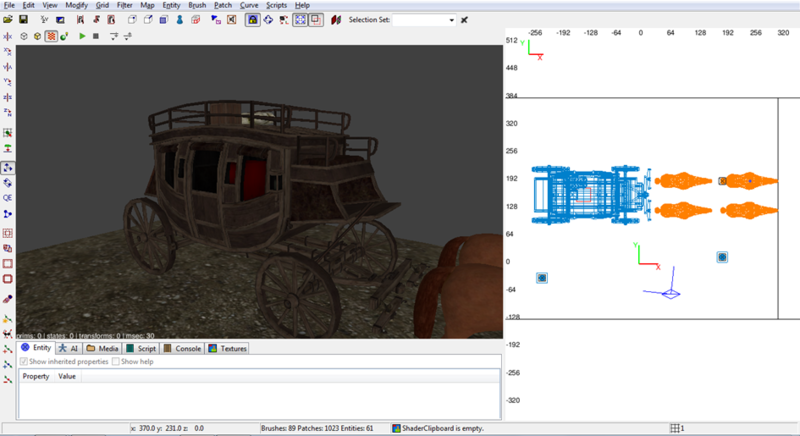 The components of the stagecoach could be converted into .ase models so they show up in the create models list, but a prefab would come with preset spawnargs and can be tweaked easily by other mappers. Edited by Dragofer, 06 August 2018 - 08:10 AM.